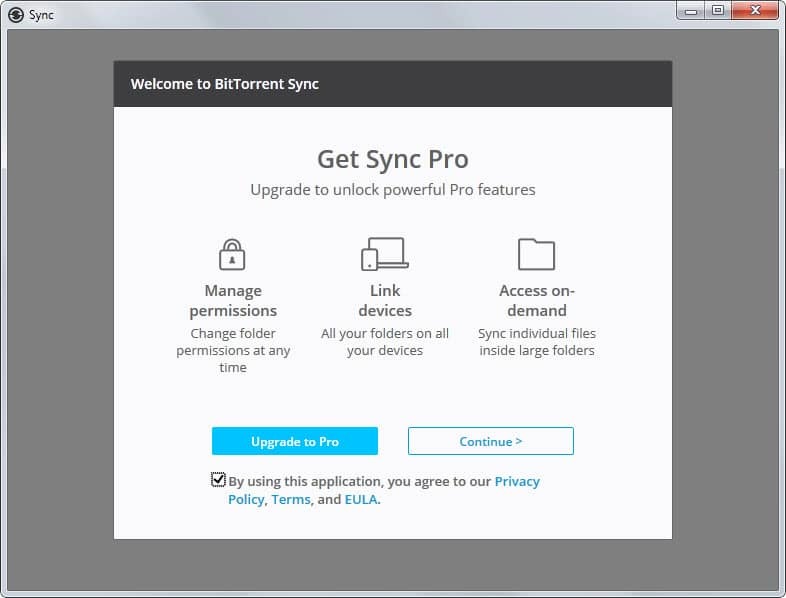 BitTorrent announced Sync 2.0 and the launch of a Pro version of the product back in November 2014 and has released the final version of BitTorrent Sync 2.0 to the public today. If you used Sync before you are probably wondering what is changing in the new version. There is still a free version available that you can upgrade your existing version to, but there is also a pro version now that offers additional features. If you never heard about Sync before, it is a file synchronization service that uses direct connections between your devices which means that no third-party is involved in the process. If you plan to continue using the free version you may be affected negatively by the update as shares have been restricted to a maximum of ten folders. You can synchronize as many files as you want and are not restricted file size or transfer speed wise just like before though. Considering that most file synchronization services require all data to be stored in a single root folder, it is not as bad as it sounds even though some users of the software may be affected by the restriction. The new BitTorrent Sync Pro is available for $39.99 per year per user offering several features on top of what the standard version of Sync 2.0 offers. Free users get access to 30-days of Pro after which the account is downgraded to free again unless a license is purchased. First, there is no folder limit in the Pro version which means that you can share as many folders as you want when you use it. BitTorrent Sync 2.0 Pro ships with several core features in addition to what the free version of the file synchronization software has to offer. Folder ownership and permissions controls allow you to set permissions for specific contacts. You can give read and write access to a folder that is usually set to read only for example, make someone the owner of a folder or revoke user access. On-demand folder access. Instead of syncing all data right away for select folders, data is only synced when requested which saves storage space on devices where this is implemented without losing access to file and folder lists. 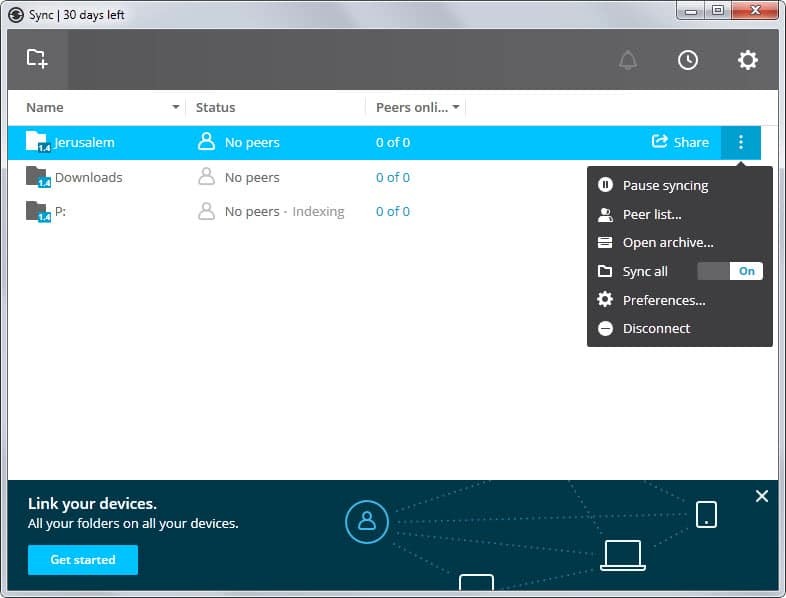 Access to all shared folders from any device thanks to private identity support. This speeds up set up time on new devices as you can use the identity to add all folders in one go to the new device. You create a private identity on the first device you run Sync 2.0 on. The process is automated and you don't have to enter any data to complete it. Especially the third feature adds some new possibilities to BitTorrent Sync. The developers have added support for select NAS devices and if you combine that with private identities, you can create your own always-on "cloud" server for all of your files using it. As far as NAS support is concerned, you may want to check out the following page on the official website for a list of supported devices. Brands currently supported include Netgear, Western Digital, Seagate, Synology and others. The core features of Sync are still all available free of charge in version 2.0. You can still use it to sync files between as many devices as you like without third-party involvement and the addition of NAS support for all users makes this even better. Sure, some users will dislike the new 10 folders limit and that is understandable as the limitation was not there before. Businesses and enterprises get additional features they will most certainly welcome: from better permission and access controls to private identity support. I think restriction to a maximum of ten folders is pretty much acceptable for private usage. I am still on the latest 1.3.x version because I don’t find the new UI and sharing method appealing. Those who don’t need the relay server capability (which I guess will be unavailable for old versions from some point of time on) can use older versions for many years without folder restrictions and a sane native UI. Finally, I have been awaiting BitTorrent Sync to go Pro for yonks. The obvious reason that I really like the idea of this program is that it enables you to sync content via peer-to-peer rather than relying on an intermediary to transfer files using the ‘BitTorrent protocol’ d(^_^ ). The feature that is the cherry on the top for me in regards to this program that I have read is possible and that I have been specifically looking forward to the most is the function to sync individual files instead of just entire folders, BitTorrent Sync Pro would be immensely useful to me if this is true. Spy agencies around the world can kiss my ###! Yes the feature is built-in to the program. You can decide to sync everything or just display placeholders and sync selectively. That is fantastic, although it is a shame that non-pro users will now only be limited to 10 folders, they would serve as really good seeds. As Tom mentioned, I hope that the at least the beta versions will continue to permit users to sync a limitless number of folders, I hope they do not plug those. However, non-pro users most likely will not be able to disable the ‘sync all’ function which would allow for files to be synced on demand… ah snap. As far as I know, only the ten first folders get synced if you have more than those in the free version. You are right about the sync-all feature as well. Only pro users get options to sync selectively. There were many times I wanted to throw together some old hardware and setup some cloud servers for personal sharing around the house whole, but always relied the native windows services for such things. Would I like to use such a service for personal files or media around the house, No because the maintenance involved would force me to remove it. Nonetheless I’ll still try it out. P.S This is what I’m talking about nice looking, clear and easy on the eyes, even the Ad’s look good with the article images. Let’s not forget to mention that Syncthing is non-crippled alternative. I use Sync since the early beta versions. It’s not bad, but still has problems with synchronization (endless loop of updates of some files, which I haven’t touched for ages). Given the free version of Sync can’t be used in business environment I won’t be upgrading to 2.0. Unfortunately there’s not much alternative (Cubby, AeroFS – both enterprise focused, with subscription). I really miss MS’s Live Mesh. The reason many do not like the 10 folder limit isn’t because it is an arbitrary limit. The reason they don’t like it is because when they announced that 2.0 would be a paid upgrade they promised that all the features of 1.4 would remain free. Well in 1.4 you have unlimited folders, so they are breaking their promise. Not a good start for a service that touts security and privacy as primary features. Nor is it a good way to try and move free software to paid software. I think there is no version 2.0 for Windows XP. I was just about to use BitTorrent Synch but have just read about the 10 folder limit.. bit of a deal breaker for myself (and probably others) as anyone with a category based system will have > 10 folders/sub folders.. If it were a one-time fee of 39.99 this wouldn’t be so bad, but the one of the points of moving to a private cloud system is to not have limitations and subscription fees.. essentially I’m paying for a service that can be provided by other solutions now..